Hi everyone! Sorry it's been a while. There has been a lot of things going on, good and bad. The (very) bad thing is that we've been informed that our company is considering closing down their Gothenburg office, which means I'll probably be out of work in a month or so. And at the worst possible time, too! I'm very worried, but trying to stay positive. 1. Make a baby food jar pincushion - This is a sweet little tutorial that CraftPudding posted a couple of weeks back, I can't wait to try it out. A great way to repurpose old glass jars! 2. Excellent bookbinding tutorial - This is a wonderful tutorial if you have ever wanted to try bookbinding but feel intimidated by all the tools and complex techniques out there. Clear instructions, helpful pics, and no expensive tools required! 3. Toadstool tutorial - I recently rediscovered this tute, it's great! 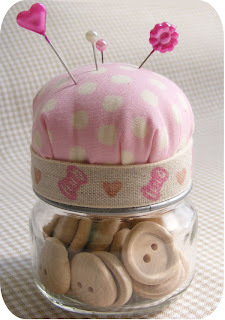 Make a cute pincushion or ornament and decorate it to your heart's content! Author LucyKate even arranged a toadstool swap - see all the photos here. 4. Fabric ATC tutorial - This tute has some great tips and tricks for making fabric ATCs. I want to experiment more with non-paper ATCs as soon as I'm done with the Craftster Alphabet ATC swap. 5. Fabric Dollhouse Tutorial - I haven't had a chance to make this yet, but I had to share it anyway. Such an adorable idea! That babyjar puncushion is the cutest! Thaks for your lovely crafty links! I am so sorry about your job, it seems that is happening to a lot of people. Thank you for those links I will go and take a look at them. Thanks for these. I am always looking for great tutorials. Love your blog name. aw, that's so tough and sad and scary! i'm sorry karin! thank you so much for this post though, i LOVE the house, i need to find someone to make it for! Yes the magazines giveaway is closed. Winners were announced in the 'Happy Spring' entry.